Kochi: It was again proved that resurrection could happen for a person through continuous music and friendship. 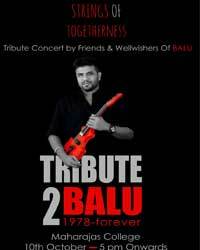 The musical evening organized by the friends and fans of late violinist Balabhaskar keeps the memories of the musician alive in every hearts. When the disciples of violinist Vishwanathan Mash and artists of Cochin Chamber of Junior Orchestra paid musical tribute to Tejaswani, the daughter of Balabhaskar, who died in the accident, the audience were recollecting their memories of the late musician and his daughter. The organizers of the memorial programme, Event Management Association Kerala (EMAK) and band members of Balu, Big Band, paid their respect to the late musician by lighting lamps in front of his portrait. The audience was in tears when Jerry Amaldev along with Sing India Orchestra decided the three favourite songs of Balu, ie Mizhiyoram, Ayiram Kannumayi, and Ellam Ormakal. Abhijith, Josey Alappuzha, Williams Jackson, and Nirmal Xavier, who shared various venues with Balabhaskar too have paid their musical tribute. The artists who participated in the memorial programme have proved that Balu was a friend, guru, disciple and also a good colleague. Singer Vijay Yesudas, who dedicated the song 'Mazhakondu Mathram Mulakkunna Vithukkal' said that Balu will continue to live in the hearts of the music loving people. When Deepak Dev came with Balu's favourite song 'Ammapuzhayude Paithalayi', the audience too joined him to complete the song. 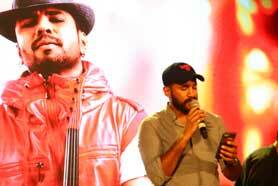 Alphonse Joseph dedicated his favourite song, 'Vidaparayukayano Vidhiyude Venpravukal' for Balu. Musician M Jayachandran said that Balu is different from anyone who lived and died. There is no death for Balu till the Malayalis love music, he said. Rathish Vega and mimicry artiste Raja Sahib shared their experience with Balu in various programmes. Violinist Manoj George, Baiju Dharmajan and Joboy Master had come out with a music composed for Balu. Vaishnav Dev, Jyotsana, Renjini Jose, George Peter, Manoj George, Abhijith, Vivekanandan, Ajay Sathyan, bands including Chemmeen and Thykoodam Bridge offered tributes to Balu. Thykoodam Sidharth, Shankar Mahadevan, Sivamani, Sujatha and Stephen Devassya too shared their memories with Balu through a video.